Drug use in the American workforce is compiled in the Annual Quest Diagnostics Drug Testing Index and 2016 showed the highest positive drug test results in 12 years. The report analyzed results of over 10 million workplace drug tests to find that 2016 positive test results went up five percent over the previous year to 4.2 percent of all tests. This is the highest annual positive rate since 2004. In 2016 there was a 12 percent increase in Cocaine positive tests. Cocaine positive testing has now increased 4 years in a row. The press or media typically highlight our opioid epidemic and the marijuana laws, but cocaine use is also on the rise. In the same study, they cited that heroin detection has plateaued and prescription opiate positive testing actually declined 28% from .96 percent of test results to .69 percent. These facts are hopeful that possibly some of the attention on the opioid crisis is having a positive impact. Quest Diagnostics also publishes this data on an Interactive Map showing urine drug test positivity regionally in the USA. 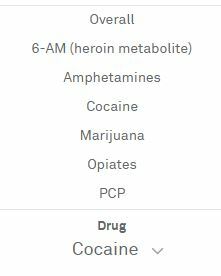 If you want to know more about what drugs are showing up in your own area, go to the Interactive Drug Map and click on the drug list at the bottom left and you will see how your area compares to the rest of the country. The interactive map is useful for determining the drug culture of your own area and gives any small business the ability to determine the best drug testing policies for your business and workforce.